The Washington Examiner is reporting that Iranian military advisors are training Taliban fighters to use surface-to-air missiles against U.S. and its NATO allies in Afghanistan. 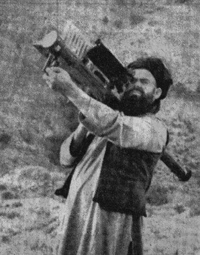 U.S.-supplied surface-to-air missiles brought the Soviet Union to its knees in Afghanistan, and an introduction of SAM technology onto the battlefield would be a game changer. Due to Afghanistans rough terrain, coalition forces are dependent on aircrafts to transport troops and supplies. If our primary means of transportation in Afghanistan is compromised, the effect could revolutionize the battlefield in a way very similar to the use of IED's throughout Iraq. Although the Iranians are training the Taliban to use SAM's, it is unknown if the Taliban has the weapons systems themselves. If this tactic is sucessful even once, I believe it will force an expansion of military presence (at least in technology). I don't like the sound of more justified defense spending.